Based in Atlanta, Lester Parcs has been writing since 2006. His articles have appeared on LIVESTRONG.COM and eHow. He graduated with honors from American Intercontinental University with an Associate of Arts. He is a licensed practical nurse and plans to pursue a dual degree in journalism and nursing at Columbia University. Initiatives such as Healthy People 2020 are encouraging consumers to take preventative measures and make informed health decisions. In 2009, The New York Times reported that sales of vitamins and nutritional supplements had been growing consistently for years. 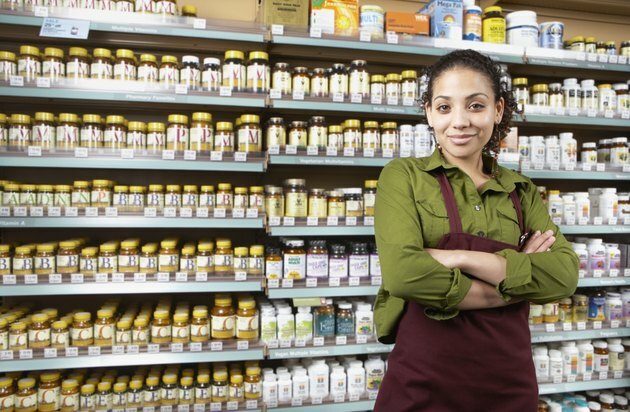 The consistent increase in vitamin and nutritional supplement sales creates stability for those who want to open nutrition stores. As the demand for vitamins continues to climb in the coming years, nutritional stores should see continued revenue. Research the type of nutrition store you want to open. Decide if you want to franchise or open the business independently. According to Entrepreneur Magazine, as of 2010 the cost of franchising a nutrition store can be as low as $45,500 or more than $200,000. There are many franchises available, and most will speak directly with you about your future nutrition store. Write a nutrition store business plan. Include a mission statement, goals and how goals will be achieved. Include start-up costs, a break-even analysis and financing basics as well as the types of products to be carried in your nutrition store. As of 2010, franchiser GNC reports estimated start-up costs include: franchise fee, $40,000; equipment, $4,500; signage, $4,000 to $6,000; fixtures, $33,750 to $53,750; construction, $35,000 to $53,000; opening inventory, $46,500; and promotional materials, $1,250. Costs will be similar in opening a privately owned store minus the franchise fee. Contact several nutritional suppliers and get quotes for initial inventory. Many suppliers will offer a discount if you agree to order all of your supplies from them. Some suppliers may beat the competition's price; use this to your advantage. If you choose to franchise, you will use the supplier provider by the franchise. Get business assistance and training. There are many free resources available through the Small Business Administration, including services on preparing a business plan, selecting a location, getting financing and managing a business. Decide if you are going to finance the business yourself, seek investors or use a bank. Employ a financing strategy that is affordable with your business plan. Choose a location for your nutrition store. Select your location based on what will be easiest for the customer base. An ideal location is close to a gym or medical complex as customers going to these locations are already health-conscious. Check into zoning and permit laws and check the area for potential competitors. Choose the legal structure of your business. Choose between a sole proprietorship, partnership, limited liability company or corporation. The structure will determine paperwork to be filed, your personal liability and how taxes will be handled. It may be necessary to contact an accountant or attorney for advice. Get an employer identification number from the Internal Revenue Service and register for state and local taxes. Obtain insurance to protect your company and its inventory. Display any literature in your store required by the federal Food and Drug Administration, which regulates dietary supplements. Network with local gyms, health care facilities and other businesses as you plan your opening. Partner with the gym to sell your products to increase its revenue and yours. Create a website as you plan your grand opening. Share the link with all of your online social networks. Allow all neighboring businesses to come to your grand opening and encourage them to set up booths to promote their own businesses. Give out coupons on the day of the grand opening to encourage customers to return. Stay current with industry news through sources such as the American Society for Nutrition.